Can you believe we are already in mid-July?! It’s crazy, I know, but summer days seem to pass by all too quickly. 1. 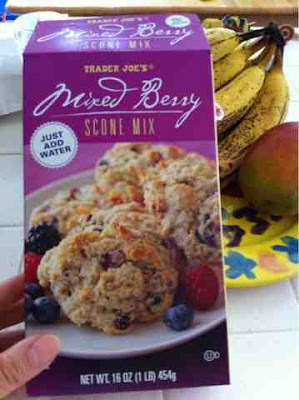 Mixed Berry Scone Mix: I love Trader Joe’s. Whenever I have play date lunches at my house, my mom friends always know they will be eating food from TJ’s. I have even influenced a friend or two to start shopping there. I just love their family friendly atmosphere and small, but varied, selection of products, which really help to narrow your choices down and speed up the shopping process when you have two kiddos in tow. So the other day, I saw TJ’s scone mix and was immediately drawn to it because of three simple words – “just add water”. 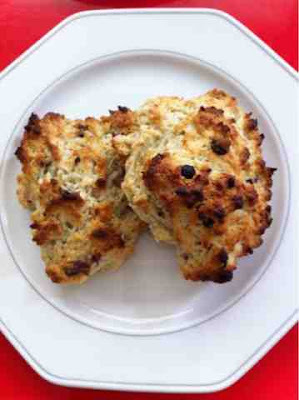 Be sure not to bake them too long like I did! 2. Hairstyles. Kate’s (of The Small Things) blog is a great place to find hair and makeup tutorials. She is a professional hairdresser and has so many creative hairstyle ideas – messy buns, different kinds of braids and ponytails, twists – whatever you’re looking for, she has it! I like to watch her youtube videos because they are simple, quick and easy to replicate. 3. “Lego House“. Ed Sheeran’s song is catchy, yet poetic. Check it out, as well as, the singer’s red hair. He really reminds me of the redhead from Harry Potter. (Edit: Turns out that it is the Harry Potter actor in this video! I read that Ed Sheeran chose him to portray himself because of their resemblance. LOL) Have a great Monday! This entry was posted in Monday Mentionables and tagged ed sheeran, food, hair.